Home to Golden's indoor pool and waterslide, hot tub and dry sauna, the Travelodge offers fully-equipped kitchenettes and Jacuzzi suites. Guests will enjoy free wireless internet and free continental breakfast. Conveniently located near many restaurants and a cold wine & beer store. Located off the TransCanada Highway, only 10 minutes from the Kicking Horse Mountain Resort. Pets: Cats and dogs are allowed. There is a pet fee of $15/night, per pet and a maximum of 2 pets per room. We've got everything you need right here at Ramada Kamloops. Our pet-friendly mini-suite was designed with you and your small pooch in mind, with one deluxe Queen bed and plenty of space to roam. Rooms include windows that open for fresh air, black-out drapes, a 43" flat-screen LCD TV with cable, free high-speed WiFi, hairdryer, a coffee and tea station, a toiletries package and comfortable arm chair. Our hotel features everything you need for an efficient stay—from free hot breakfast and onsite laundry facilities to free WiFi and a business center. Plus, we’ve got extras to make your visit memorable, like a relaxing indoor pool and hot tub, and well-equipped fitness center. Forgot something at home or need a snack? Our convenience store is stocked with on-the-go essentials. Each non-smoking room features a flat-screen HDTV, work space, microwave, mini-refrigerator, coffee and tea maker, safe, and iron and ironing board. Pets: Dogs are allowed with a pet fee of $25/night, per pet. There is a maximum of 2 pets per room. Dogs must not be left unattended in the guest room. Pets must stay on a leash at all times. Please let us know in advance if you are travelling with a pet as we have designated pet-friendly rooms. The South Thompson Inn & Conference Centre is a four-star riverfront unique Boutique Inn. With 55 acres along the South Thompson River there is lots of room for you and your four-legged friend to explore. We offer complimentary welcome kits for pets as well as toys, leashes, bowls, treats and pet waste bags. All guest rooms are complete with luxurious bath robes for guest comfort and open balconies providing spectacular river or mountain views. The Inn offers complimentary amenities including Wifi, parking, lawn games, mountain bikes, seasonal outdoor heated pool, river view hot tub, fitness centre, & a fresh coffee & tea bar. The Inn has been number one on TripAdvisor and has earned the Certificate of Excellence for the past eight consecutive years. Pets: Pet fee of $30.00 per day, per room. Pets must stay on a leash at all times. Please let us know in advance if you are travelling with a pet as we have designated pet friendly rooms. Our Stable Suites are still "pet stays free". Note: Property has resident pets. Quiet, quality comfort for less! Scott's Inn is located close to the shopping mall, hospital, sports arena, the university and the casino. We offer newly renovated, air-conditioned rooms and kitchen suites. COZY STAYS AT AFFORDABLE RATES. Enjoy the comforts of easy travel while you stay in Kamloops. Enjoy your stay at our clean, comfortable and friendly, yet affordable Canadas Best Value Inn of Kamloops, British Columbia. We are conveniently located just off the # 1 highway at exit #368. This quaint inn is centrally located and offers 37 nicely decorated deluxe guest rooms. Pets: Pet fee of $25/night, per pet. Maximum of 2 pets per room. Restrictions may apply; please contact our hotel for details. Located in the the "Heart" of Downtown Kelowna, just one block to the beach! The Royal Anne Hotel offers both business and vacationing travellers the ideal mix of splendid accommodation and ready proximity to key business areas and major tourist attractions. Family-oriented, mountain lake fishing resort. Located north of Kelowna, then 19km east off Hwy 97 on a good gravel road. Accommodations are mostly lakefront, self-contained, fully-serviced cabins or rustic housekeeping cabins, kitchens included. Camping available. Walk-in access to 5 outer lakes. Please browse our website for complete info and photos. Pets: Pets are allowed in cabins. If outside, they must be tied and must be on leash when walking on camp property. Owner is responsible for clean-up. Hiking trails are available where pets can run. Please inform us of the type of pet you have when making reservations. Note: Property has resident pets. At The Coast Capri Hotel "We Gladly Accept Returns". We are centrally located just 5 minutes from downtown and Lake Okanagan, and 15 minutes from the Kelowna International Airport. Whether travelling on business or pleasure, the Coast Capri Hotel is committed to providing outstanding customer service, award-winning dining and uncompromising attention to detail to make your stay a memorable one. 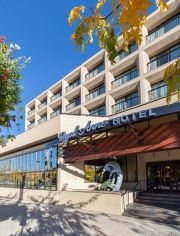 The Kelowna RAMADA Hotel & Conference Centre offers 135 deluxe rooms and suites. All rooms feature pay per view movies and Nintendo, hair dryers and in-room coffee makers and new flat screen T.V.'s. Our swimming pool, whirlpool and fitness facility are available for your enjoyment. We'd like to introduce you to our impressive line-up of brand new Sunshine Coast Executive Cottages, our oceanview luxury suites and rooms and our decadent executive penthouse. Naturally, Sunshine Coast Resort is your ideal basecamp for all recreational activities on the BC Sunshine Coast. From our fleet of professionally maintained Sunshine Coast Boat Rentals or spectacular marine tours to world renown Princess Louisa Inlet to local Pender Harbour boat tours and professionally guided fishing or sailing charters. From fantastic golfing and world class scuba diving to idyllic ocean kayaking, hiking and mountain biking to horseback riding and lake swimming. Sunshine Coast Resort has it all. Pets: All pets welcome. Must be kept on a leash and not be left unattended in guest rooms. Pets must not cause any disturbances for our other guests. There is a fee of $20.00 per pet per night; $60.00 for multi night stays. Pet restrictions on some room types! Please inquire for details. Pet blankets provided. Please bring your own dog beds, bowls and leashes. Dog walking area on property. Note: Property has resident pets. Experience the tranquil beauty of the Gulf Islands from your base at the Blue Vista Resort, Mayne Island, B.C.! Tranquil park-like setting with ocean views from the property. The BEST WESTERN Dorchester Hotel is conveniently located in the heart of downtown Nanaimo, overlooking picturesque Nanaimo Harbour. Our charming heritage boutique-style hotel is decorated in a style that blends old world class with modern conveniences to make your stay a comfortable and memorable one! An award-winning resort - "Relax in Style"! Inn on Long Lake features spacious, well appointed rooms, all with lake views and a private balcony or patio overlooking the beach and grounds at the North end of Long Lake.